Citizenfour. 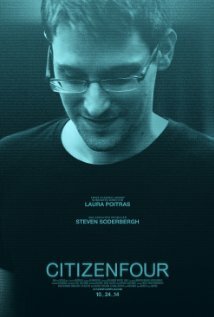 The Oscar winning Edward Snowden documentary. Is this documentary worth watching if you’ve seen and read all the coverage there has been regarding the Edward Snowden NSA whistleblower story, if surveillance programs like Prism, Echelon, Tempora, Bullrun and so on hold ‘no secrets’ for you anymore? Yes it is. What was interesting to me is that we get to see the behind the scenes that lead up to the gradual revelations surrounding the secret NSA serveillance programs and the media reaction to it, or better the reactions in the media of the different players involved. The unfolding of history in the making, seen from the Snowden angle and of that of the journalists involved. At a certain point in the film we get to see the first images in the news of Snowden, the images through which we got to learn about him. We now notice how short they are and how soundbite like they sound compared to the more extensive explanations and reasons Snowden gave for his actions in the part of the documentary leading up to this point. We see a man who is fully aware of the severe personal consequences his revelations will have on his life. We get to see his constant, in some cases extreme, paranoid behavior. In those instances he’s become a real life version of such fictional characters as Harry Caul (Gene Hackman) the surveillance expert as seen in Francis Ford Coppola’s ‘The Conversation’ (1974) and Avner (Eric Bana) a Mossad agent in Spielberg’s ‘Munich’ (2005). Characters that with the knowledge and experience they’ve gathered in their professional life know what might be in store for them next. Anybody who aspires to become a serious journalist should be forced to see Alan J. Pakula’s ‘All the President’s Men’ (1976) ) (depicting The Washington Post’s handling of the Watergate affair), Vincent Garenq’s ‘L’enquête’ (a.k.a. The Clearstream Affair) (2015) and Laura Poitras’ ‘Citizenfour’. The Pakula film to learn what fact checking and double checking is all about and the latter two films to see how to deal with sources and determine how reliable they are, as there’s always the danger of manipulation by a source as the Clearstream affair showed. The doc. airs on Canvas on 01nov15 at 21h40. < Previous Saul fia (Son of Saul). Hungarian Holocaust drama. Focussing on the unfocusable. Next > D’Ardennen. (The Ardennes). Gripping family crime drama. Congratulations with your blog and informative blog posts :). I have missed the Snowden documentary on Canvas. I should consult your blog more regularly, evidently :). As a sidenote, the European Parliament adopted a decision last week urging European countries to grant Snowden asylum and consider him as a whistleblower (and not as a traitor) so maybe the ‘personal consequences’ of his actions might get alleviated somewhat in the future (if any national government is brave enough to actually implement this EU decision, that is, and go against the unamused US).